So glad you're here. Before you play your first video, let me point out a few features that will help you get the most out of this course. That's the menu to your left. Use it to move from one lesson to the next. This is the bread and butter of the course. It should look good on all devices--let me know if you have any problems. There's a full-screen button if you want it. That's what you're looking at right now. Check this out before you watch each video. It'll include tips and also links to stuff I reference in the video. Once we get working on songs, you'll find jam tracks here for whatever song you're learning. Playing along with recordings is fun and teaches you how to play at a consistent speed. This is mostly for chord charts and other printable reference materials. I'll usually mention in the video if there's something of interest here. Most people will want to just watch the video, but if you prefer to read for whatever reason, here you go. Transcript may not perfectly match what I say, and does not include graphics I use in the video. Ok, hit play on your video and let's go! Hi, my name’s Rob Hampton, welcome to my guitar crash course. My goal is to get you playing and, if you like, singing the music you love as quickly as possible. I teach you the skills you need to know by teaching you one of three songs--you’ll have a blues, rock, and country tune to choose from. By the end of this course, you’ll know how to play the A, D, and E chords, you’ll know how to strum, and be able to play the song you chose all the way through, and sing along with it if that’s your thing. I was inspired to make this course because my teaching approach has worked so well with my private students--they’ve progressed so quickly and have had so much fun doing it--I figured there’s got to be a way to to share my teaching with people online. Learning guitar online makes so much sense for so many people. It’s cheaper than private lessons, you can do it on your own schedule, and even if you wanted private lessons, it’s often hard to find good teachers. So I’ve worked hard to give you the same fantastic experience my students get in their private lessons, at a fraction of the cost. 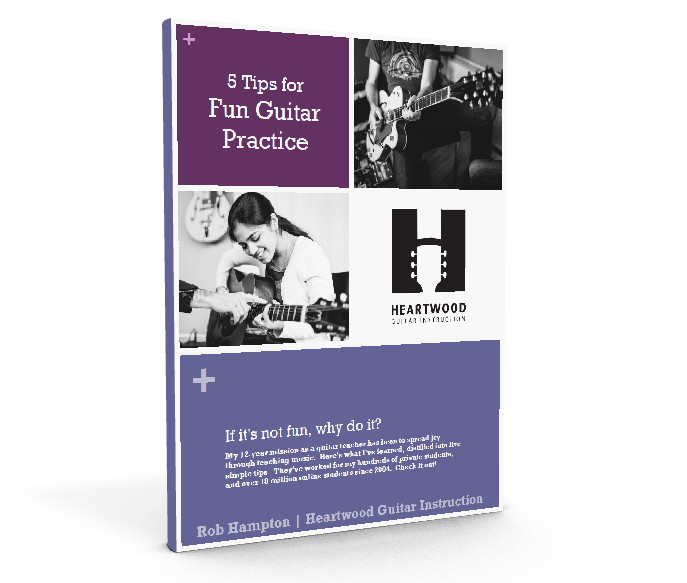 There’s really great need out there for a fun beginning guitar course. I’ve seen the other popular guitar instruction sites, and a lot of them have huge collections of videos, by dozens of teachers. They’re terrific resources for advanced musicians. But the content for beginners isn’t that great. Their main focus is preparing you, setting a foundation, which is important, but how much fun is preparation, really? Preparation is what you do before you have fun. They have you learning chords and scales and theory for hours and hours before you actually start making music. They’re totally out of touch with what makes learning fun, and for the vast majority of people, that means playing music you love as soon as possible. And most of them totally ignore singing, even though the easiest way for beginners to play a complete, great sounding song is to sing while strumming the guitar. So how do I make it fun? I call it song-based instruction. Early on, you’ll choose one of three songs I teach in the course. And then, every time you learn a new skill, you apply it to that song. As you get better, the song sounds more complete, and by the end, you’ll be singing the tune--if you like--while strumming it. Along the way, I’ll be teaching you the skills you need to teach yourself more songs on your own. I hope you like the songs I teach in the course, but they really aren’t the goal I have in mind for you. The goal is learning those songs you love, the ones that made you want to pick up the guitar in the first place. This course prepares you to go and learn those songs on your own. Now unless you’ve never touched a musical instrument, there’s probably some stuff in here you already know. Feel free to skip those lessons, including the two coming up on how to buy a guitar if you’ve already got one.